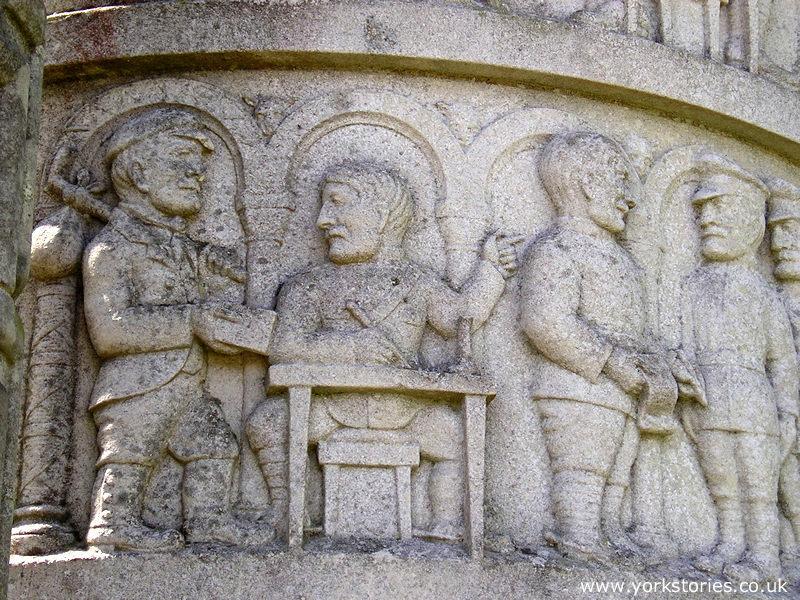 This memorial is alongside the B1253 through Sledmere. 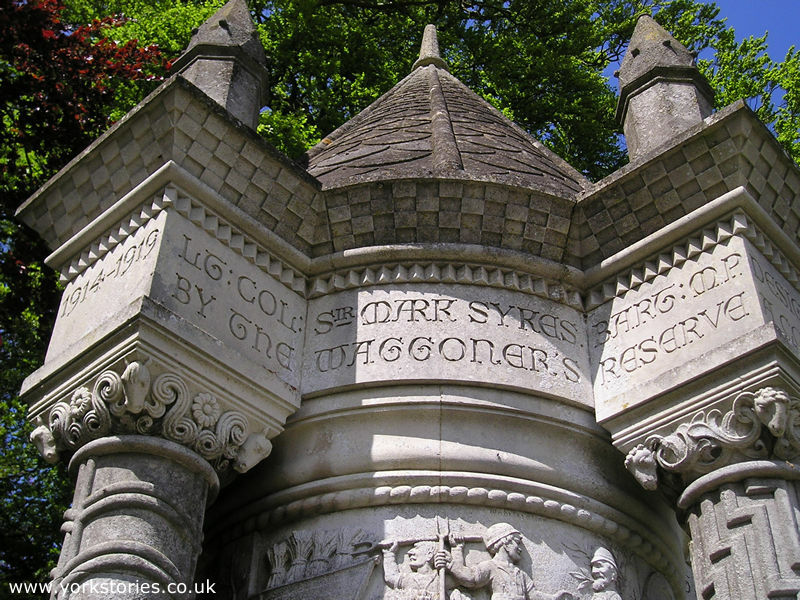 It is a memorial to the men of the Waggoners Reserve, and it’s unlike any other memorial I’ve seen. 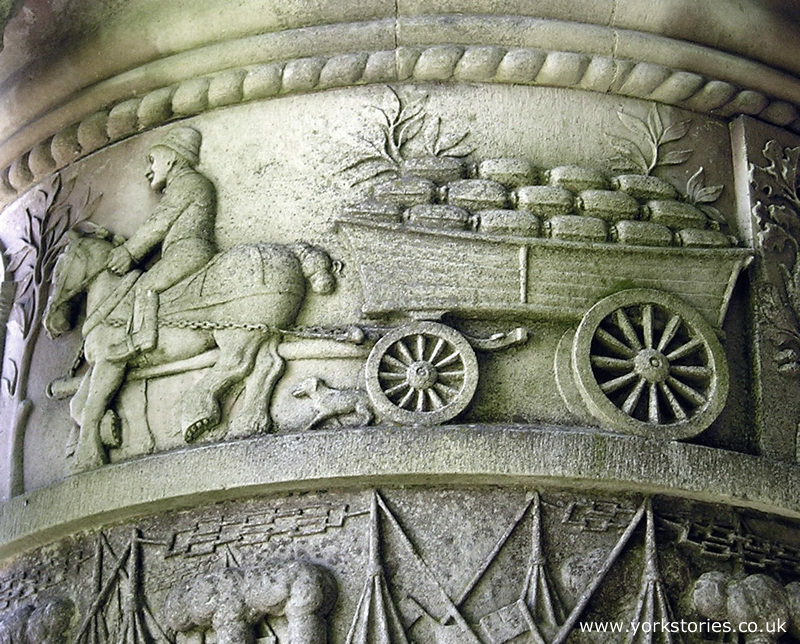 Carvings that the Pevsner guide calls "curiously homely" depict the story of the corps, raised from the local farms. 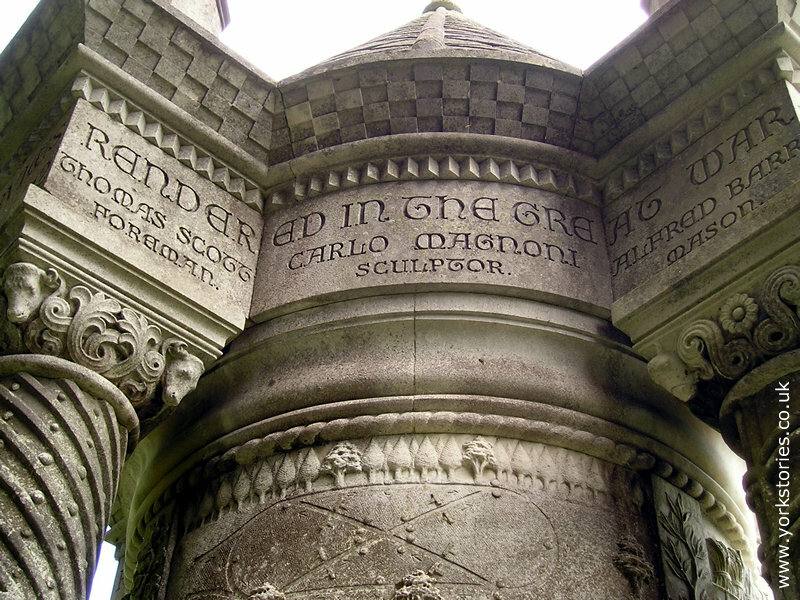 The memorial was carved in 1919 by Carlo Magnoni, from designs by Sir Mark Sykes. Most of the photos below can be enlarged by clicking on the image. 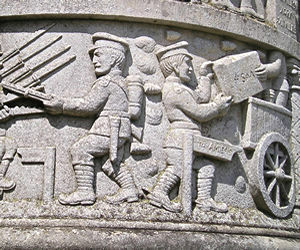 The Waggoners were an army transport unit, whose recruitment began before the war. 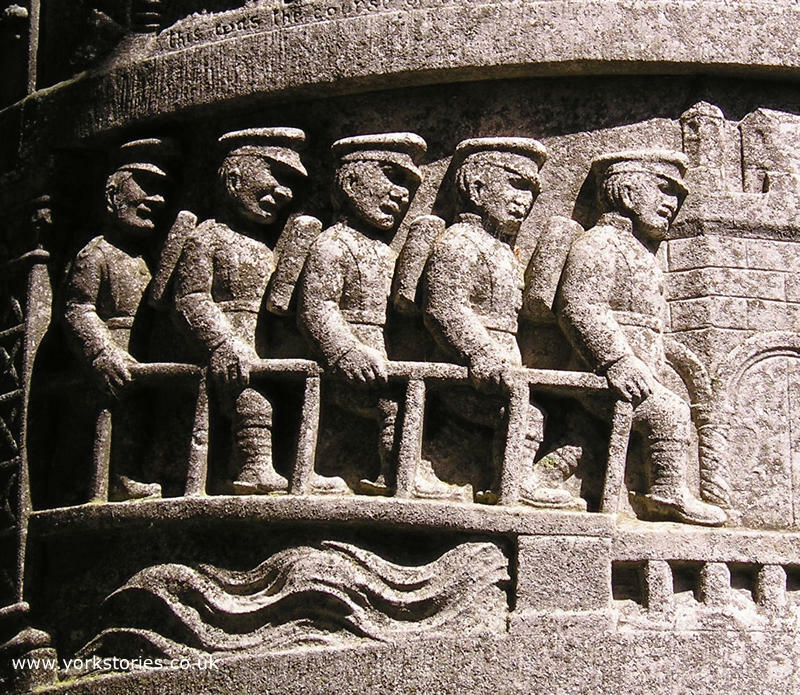 These men were intended to provide a core of trained wagon drivers to supply front line positions, and they joined the forces at the Western front during the First World War. The carvings around the circular body of the monument tell their story, in various scenes. 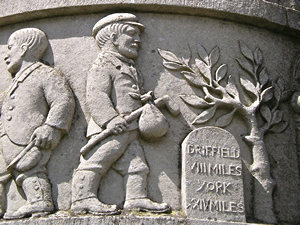 The carvings above show the men working on the land, then apparently on their way to war, on the road (complete with a milestone showing the distances to York and Driffield). 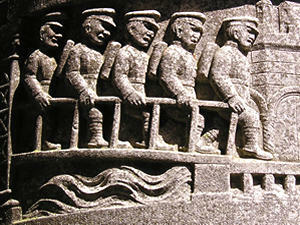 Here, above left, they appear to be boarding the boat to cross the Channel. 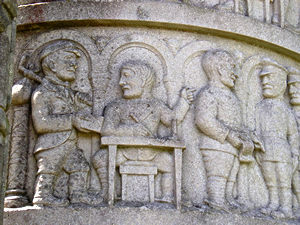 The panel above right presumably shows the enemy, engaged in barbaric acts. One soldier is torching a building, while the other is holding a kneeling woman by her hair. 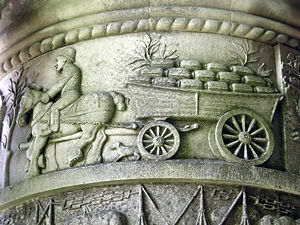 More details from the memorial – a man on his horse, pulling a loaded wagon. Above right, the volunteer waggoner (with his bundle of possessions on the stick over his shoulder) with a man at a desk, who is pointing the way – presumably to the boarding point for the ship. 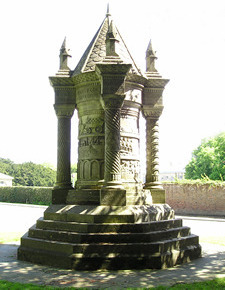 The monument isn’t tall and elegant like the nearby Eleanor Cross. It gives an impression of solidity, in its overall shape (kind of small and "dumpy") and in the carved figures, including the animal heads on the supporting columns. I can’t really find the words to describe why it’s so moving, when looked at in detail, so I hope the photos go some way to conveying this. For anyone who would like to read more about the Wolds Waggoners, links are given below. 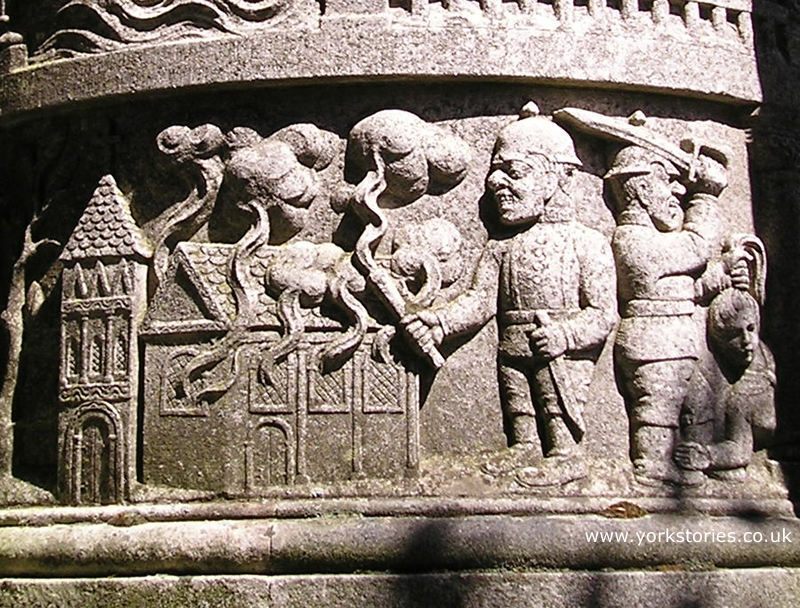 A few years ago, the Wolds Waggoners’ story was covered on a BBC radio series Voices of the Powerless. An accompanying page has accounts of the war from soldiers who served. The second of these, by Lance Corporal R H Temple of Driffield, is a moving description of looking around a Belgian village, destroyed by shells. 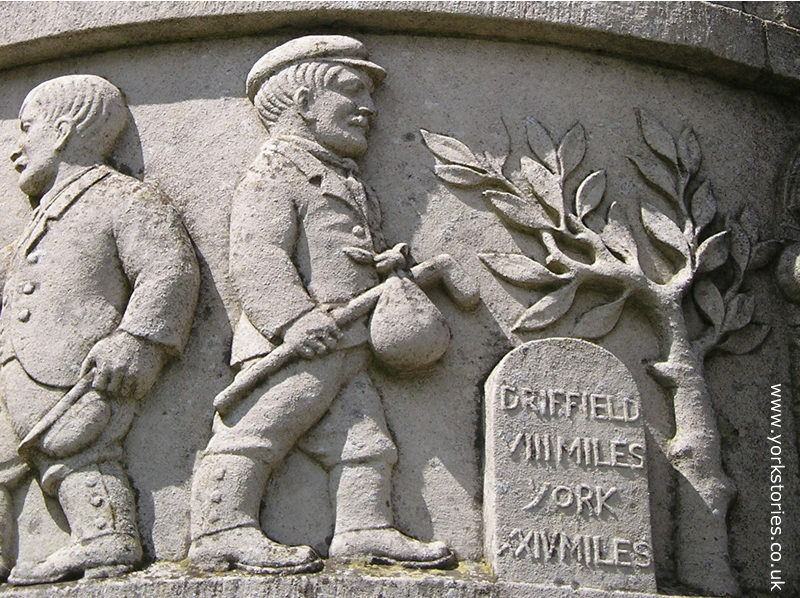 The website also includes a collection of WW1 letters from the Driffield Times, collected by Della Petch. 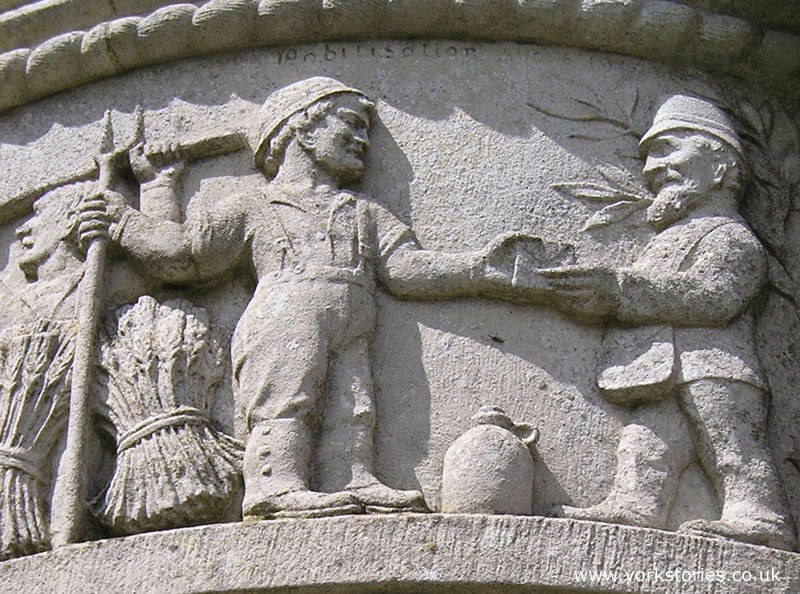 These contemporary sources are a fascinating insight into this period in our history. A letter from W J Maltby, writing to the newspaper on 5 Dec 1914, wants to encourage "those in Driffield to come and have a rub at the Kaiser’s half hearted lot." 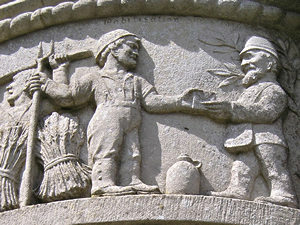 He describes the Waggoners already there: "men who have had no training of any description who are out here doing the same duty as others with years of training need some little praise for their work, which is done to perfection." my Grandfather Richard Baron was a Wagoner ..my cousins Lesley Humphreys .Margarte Gough and Mary Walker will be visiting this weekend ….I will be with you in thought …..all the way from Brisbane Australia .